Although many line and staff officer's throughout the war chose to wear standard sky blue overcoats, a few officers opted to go for a more stylish look inspired by the French. While only a few of these coats exist today, those that do offer us a great look into the fashion fads on Officer's Row. Ezra Carmen was first commissioned as Lt. 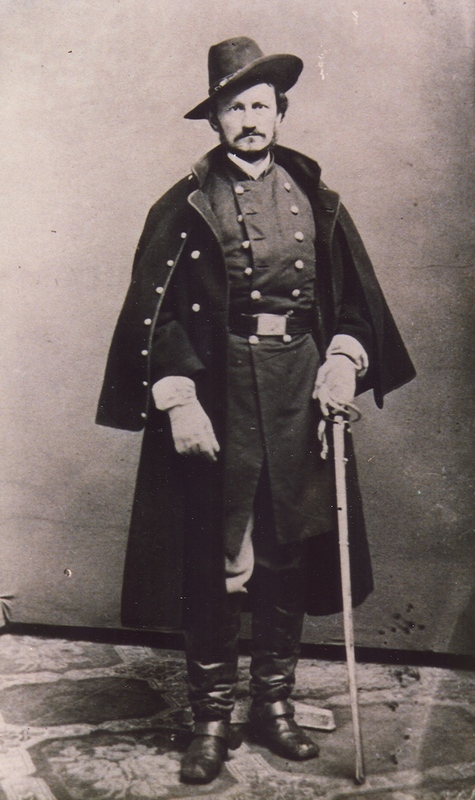 Colonel of the 7th New Jersey Volunteers under General Phillip Kearny and was quickly promoted to Colonel of the 13th Regiment. While Colonel, he had this coat tailor made for him. It is cut from a fine broadcloth, trimmed in wool and lined with a bright blue flannel lining in the body and a blue polished cotton in the sleeves. It has a detachable cape, a vent in the rear, two front pockets, an inside pocket, a fall down collar and is closed with frogs-n-toggles. Below are some images of the coat, please click on any of these image for a large view.